Why don't you have any information on Hildegard's scientific career when you are the International Society of Hildegard von Bingen Studies?? I have a project due in two days, and I want information up here tomorrow morning. I can find no other descriptive resources for this part of her life. I was really hoping that this website would be a diamond among all of the stones that I have come across. Thank you for ruining my unstable hopes and dreams and wasting my precious time. I will now have to stay up all night reading like a non-lazy college student (which by-the-way do not exist). In this endeavor, I will also end up keeping my roommate up all night as well. She also thanks you.. I apologize for your inconvenience, We have just recently relaunched the website and created this heading this week. As such, we have yet to have contributors for this field. That said, I am certain by now your intellectual curiosity has guided you to peruse the rest of the website, "Academic Sources" and "Links" which includes a link to various bibliographic sources not to mention the over 6,000 titles which can be found via World Cat. I am certain you can access many of those articles via your University library. Nonetheless aside from from her source works in Physica and Causa et Curae -- Off the top of my head, Florence Eliza Glaze's entry, "Medical Writer: Behold the Human Creature" which appears in Voice of the Living Light: Hildegard of Bingen and Her World. edited by Barbara Newman (1998) is a fairly well known, and ubiquitous work on this aspect of Hildegard. And some friendly advice. try to approach life and work with understanding. Lazy professors do not exist either, nor have forgotten what life was like when we were student's especially in the pre-Internet age (i.e. before information and audio/video sources could be readily accessed at our fingertips). Work and life just gets more complicated and stressful with the addition of deadlines, children, home maintenance, community obligations, volunteer work (such as this website) etc., Only with much less time to incorporate it all. Good luck on your paper - I look forward to reading it if you would like to share it. Thank you for your time and help. I truly appreciate the time you took to reply to a less than polite comment, and I sincerely apologize for my rudeness. I am aware that this is no excuse, however at the time I had been up for a little over 38 hours (caffeine does wonders). Again, thank you for the resources and advice you gave me. I shall keep them in mind. Also, I checked your FAQ sections for information on whether or not Hildegard was an actual abbess, and I was satisfied with the answer I recieved. But, would it be incorrect to call her an abbess in my project even though she is widely reffered to as such? 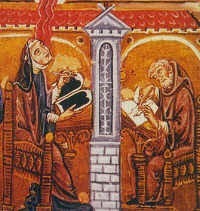 Regarding the abbess question, depending on suggested length of paper and the formatting requirements you might mention in the body that Hildegard is commonly referred to as abbess, and then footnote that technically she was a magistra, It seems only Frederick Barbarossa referred to her as abbess. Below is the footnote (Turabian style) I placed on page 25 of my 2007 thesis "Symphonia Caritatis" referencing an article by Constant Mews. Another college student here, I am currently researching for a paper about Hildegard that is due in about 3 weeks. I've looked through some of the "Academic Sources" and "Links," but there is just so much information that I keep getting lost in everything. I was hoping that you may be able to help point me in the right direction. I need to write an essay that analyzes Mistress Tengwich's critique of Hildegard and Hildegard's reply. I have read the critique and the response, would you be able to give me some background or point me toward a source that will give me background? Also, I can talk about the role of women, the role of monasticism, and the role of direct revelation (Hildegard's visions) in the medieval church/medieval society. I would like to maybe find something about why exactly Hildegard believed how she did about each of these topics. Any help would be greatly appreciated. I have looked through many sources and while some of them are helpful, many are not. Thank you for any help you can give! Is there any online copy of "Physica" in english (the complete works)? The only complete English translation of Physica is that of Priscilla Throop (Rochester, VT: Healing Arts Press, 1998), available only in "preview" mode through Google books: https://books.google.com/books?id=wl6w2cfCKTgC I am not aware of any other major version available online. "Pulverize a bit of ginger with more cinnamon. Take less sage than ginger, and more fennel than sage, and a little more tansy than sage, and crush them to a juice in a mortar, and strain it through a cloth. Then cook a bit of honey in wine, and add a little white pepper and put it in the powder and juice. Afterward, take duckweed, and twice as much tormentil, and the same amount of mustard which grows in the field,, and rub this to a juice in a mortar, and place it in a little bag, and pour the honeyed wine mixture over it, and make a clear drink." Here is a version of Hildegard's Duckweed Elixer that pulls from the same resource as Nathaniel's comments, above. I'm sorry we're just getting to this, we overlooked it over the holiday. Best of luck! Please let us know about your success! Thanks for that detailed recipe and the link provided. I have tried the Duckweed Elixir in the past and will try to make it myself this time! In which book Hildegard writes about fasting? And also this book of Hertzka which mentions how cancer develops - it is supposed to come from Hildegard books? On fasting in a religious sense, it's in Book Two, Vision Six (section 39) of Scivias. She argues that communion should be taken by everyone while fasting, unless one is sick or in danger or death. In Causes and Cures (translation in Holistic Healing) she mentions fasting only in that those who exaggerate their fasting-- i.e., do too much (as we see happening with some of the later mystics interestingly), it is dangerous and can cause disease, joint problems, and swelling. I might also look at Caroline Walker Bynum's Holy Feast, Holy Fast to see if Bynum nuances Hildegard's position of fasting. On cancer, also in Causes and Cures (same translation), she blames the humors, but her description doesn't seem to match cancer within one's body. Hers is a description of the external body, with swelling, boils, mis-shapen feet, and cancers that "break out." She does say that people cannot live long with this condition. I think a more accurate description of cancer, i.e., lung, etc, is under her section (same translation) under "Tumors." Here, she also blames the humors, but she specifically mentions the inner organs: heart, liver, lungs, stomach and remaining inner organs. If the tumors remain in a person, they make him sick. However, if they break out of him, they make him healthier. I'm not thrilled with this translation, but there's really not much else out there in English. And it would take me too long to translate from my now very rusty Latin. This question, and Allison's comments prompted some research on our part. Allison nailed it right off the top of her head! We had to do some additional research! In Hildegard's Liber Vitae Meritorum (The Book of the Rewards of Life), she makes several references to fasting; primarily as a means to atone for most vices and sins. In Mary Palmquist's English translation of Causae et Curae (Holistic Healing), which Allison mentions, Palmquist opens with a quotation by Hildegard, which emphasizes Hildegard's concept of "discretio". A prescribed Hildegard fast, seems to reflect a modern interpretation of Hildegard's beliefs around moderation and balance, insofar as diet is concerned. Perhaps it's not too far off, in our modern world of abundance. Here's more comments on the topic. As with fasting, it seems that many of the current references to cancer attributed to Hildegard are modern interpretations. Much of the 20th century interpretation of Hildegard medicine can be attributed to Hetrzka and Strehlow. Victoria Sweet has published two pieces on Hildegard medicine, "Rooted in the Earth, Rooted in the Sky", and "God's Hotel". Both are deeply researched, particularly "Rooted in the Earth", which I believe was her doctoral dissertation. How many original copies of 'Physica' from 1533 are there still around? Are there any resources from where a copy of a specific page can be acquired? I work for a museum in Amsterdam and I'm searching for Hildegard von Bingen's reference to hemp and its medicinal qualities in the original Latin edition. Thank you for advising. The older Latin edition was printed by Migne in PL 197, cols. 1117-1352, which you can find online through Google Books: http://books.google.com/books?id=uPQQAAAAYAAJ. A new and improved Latin edition was published by De Gruyter in 2010, ed. Reiner Hildebrandt and Thomas Gloning; it is also available completely (I think) through Google Books: https://books.google.com/books?id=iAwg2M_KruwC. This is wonderful, thank you! Do you perhaps also know if there are any manuscripts of 'Physica' or previous versions of this text, being kept in the collection of a library or a museum somewhere? The introduction to Hildebrandt and Gloning's 2010 edition should include a list of manuscripts. Are there any international conferences on Hildegarde? There are no regularly scheduled conferences specifically devoted to Hildegard, but there are frequently more locally organized events. The Society sponsors a Hildegard session at the annual International Congress on Medieval Studies at Western Michigan University each May (https://wmich.edu/medievalcongress). We also try to list as many other events as we know about through the Society's Facebook group: https://www.facebook.com/groups/hildegardsociety/. The Scivias Institute in Germany also often organizes events in and around Bingen: http://www.scivias-institut.de/index.php/welcome.html. There seems to be a bit of a discussion on how much of the 1533 Physica text is based on the original manuscript by Hildegard. Parts of it might be added by others. Would you happen to know how sure we are about the part on herbal medicine? I am notably interested in the mentioning of hemp and would like to know if it's a fair assumption that Hildegard wrote this.